Huge news flash! Check out your window to see if pigs are flying because I ran 5 miles yesterday and DIDN'T FEEL TERRIBLE. I got out of work around 6 and wasn't really feeling it, but I set out from the office and...kept going. I didn't feel super slow, I wasn't bored, and at one point a rainbow even appeared in the sky. The rainbow refused to be photographed but I did capture this gorgeous view. Anyways, besides my crazy running epiphany, I had another great workout this week. I tried a Pilates reformer class for the first time on Monday, just in time for my March goals. 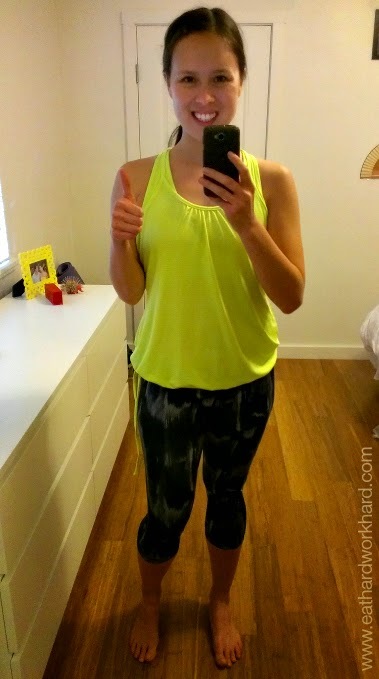 So for today's Workout Wednesday Linkup I'm sharing some tips and a review of the class I took at PULSE Fitness. 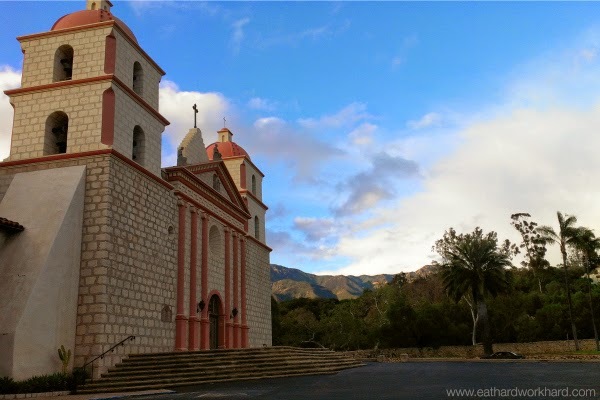 Wear tight fitting, stretchy clothing and prepare to be barefoot. You'll be twisted into lots of crazy positions and don't want to worry about your top flipping up or pants falling down. Drink plenty of water beforehand, as the transitions are fast and it's tough to take a water break, but not so much your stomach is sloshing around. Prepare yourself to be confused, to watch first, and to ask questions. Form is very important in Pilates and it includes lots of unfamiliar motions so, when in doubt, ask for help! Go at your own pace. Again, since the moves will be working muscles in unfamiliar ways don't be afraid to go at a slower pace, take breaks, or use less resistance. Now on to a review of my first Pilates machine class. I picked PULSE Fitness because of their great Yelp reviews, their tagline "Pilates for everyone" (love that! ), and this amazing Groupon deal. But, because barre 101 proved the value of trying a class before buying a package for me, I paid the full price single class fee to give it a go. Another reason I picked PULSE was because they use the famous/infamous "Megaformer" developed by Sebastien Lagree. According to Lagree's company, their workout system effectively combines strength, endurance, cardio, balance, core and flexibility in every move. 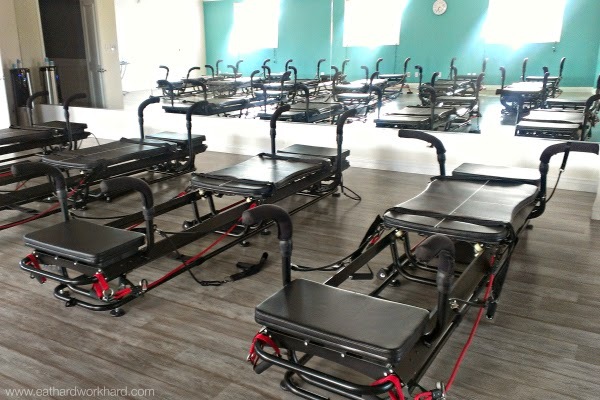 The machine uses a gliding platform with adjustable spring resistance that supports training at different angles, providing a workout that can hit different muscles and be more challenging than mat classes while still being easy on the joints. During my research I also found this article which called the Megaformer a "Pilates machine on steroids". Sold! I arrived to my 5:30 class 15 minutes early and there wasn't anyone at the reception desk to check in with since there was a 4:30 class finishing up. I got momentarily freaked out that my class actually started at 5:00, but after checking the time I settled in on the couch in the small waiting area to watch the end of the class. As soon as the 4:30 class ended, the instructor, Lacey, came over and introduced herself and identified me as a new student. She was very helpful and promised to give me as many corrections as possible during the workout, told me to go at my own pace and concentrate on form, showed me how to set up the machine, and introduced me to everyone as a newbie. The workout started right away with some gliding planking abs work. All the moves had unfamiliar names like "wheelbarrow", "catfish", and "teaser", but Lacey was great about explaining each move and giving corrections so that everyone could follow along. And with only 10 people in the class, it felt like I got the attention I needed as a beginner. After we finished up with abs, we moved into a crazy hard leg sequence. Picture standing at the beginning of a lunge with your front foot stationary and your back foot on the gliding platform part of the machine, pushing your back foot out and then pulling it back in as you lunge down and up, AND doing a bicep curl with the machine's straps at the same time. Definitely felt the burn in muscles all over my body! We finished with some more ab moves and a plank, and then some amazing stretching. I especially loved being able to get a little extra range of motion using the platform to open up my hips. Just like that, 45 minutes had gone by and I was out the door. I could definitely feel the workout, but I also felt amazing. Instruction: As a complete newbie, I really appreciated Lacey's easy to follow instructions and the level of individual attention from the small class size. Intensity: This was a great total body workout that I felt in my core, arms, the small muscles of my back, and ALL my leg muscles. I didn't wear my heart rate monitor but I definitely broke a sweat and was out of breath a few times too, so I'm sure I got a little cardio in as well. Atmosphere: I loved how supportive and welcoming everyone was, especially when they heard I was new. Plus the playlist was great, the studio was clean and bright, and there was a great vibe overall. Price: Regularly priced single classes are $25 and buying a 20 class package only brings that down to $18 a class. I understand that maintaining the machines and small class sizes is pricey, but it's still a lot for my cheap self to think of spending. Availability:There also aren't a ton of class times, with only one class a week starting after 5:30 pm. And classes fill up quickly, so signing up early is a must. Q: Have you tried any fun new fitness activities lately? 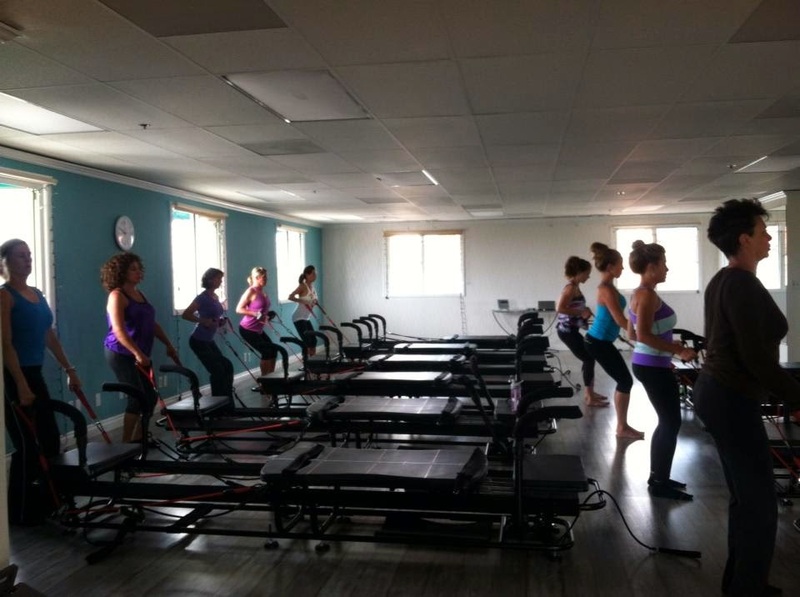 Ever done Pilates on the reformer/Megaformer? Doesn't it look like a medieval torture device? OK I see you, runner girl! I think Cali's lack of humidity makes running soo much more enjoyable than in DC too. Great review too- I want to try this out! Thanks! I definitely think you would like it. You will be sore but satisfied! Thanks! 5 mi is like nothing for you :) What is this gravity machine?!? It sounds awesome!! My gym has this one: http://www.totalgym.com/p-82414-total-gym-gts.aspx looks a little bit like a reformer. Oh man that looks awesome/painful!! I want to try it! Yea to each his own. Thanks for stopping by! It definitely looks like a medieval device and, no, I haven't tried this kind of Pilates. Looks like fun! Congrats on the 5 miler, I hope Saturday's run goes just as well! The reformer looks awesome! I've heard of it, but never knew what it actually does...sounds intense! Congrats on falling in love with running! I would love to go for a run in Cali! Thanks! I love trying new workouts. Keeps me going and makes for good blog fodder :) The top is from Old Navy and was super cheap!! #wowlinkup - We have MegaFormer classes in my area. I am addicted. I think they work my trouble zones like no other workout. Yes definitely agree! Thanks for stopping by! Never heard of this kind of workout it looks like it's a great workout but hard.